Thieves. Their goal in life is to take whats yours - and theyll break into your business or home to do it. Trust SVAT to make them think twice about your property. Statistics show buildings under surveillance intimidate burglars - often they wont even bother and move on. But if they do manage to make it in, SVAT will help stop them from getting away with it. Our cameras deliver high-quality video that can assist in putting them away. Dont give thieves a chance. Stop them with SVAT ! Youd expect a system that keeps such a close eye over all you hold dear to be complex. Youll be surprised how easily this SVAT system operates. It functions just like a computer, with a mouse for pointing and clicking and an intuitive icon-based Smart Menu that provides prompts and coaching to assist you in navigating the system. Its even so simple to use it will begin recording as soon as its plugged in. Everyone needs a vacation to get away from it all. With SVAT you can enjoy yourself with peace of mind, knowing you can view your camera footage live online, anytime and anywhere. On either a PC or Mac you can use such search engines as Internet Explorer or Safari. You can also view footage on almost any smartphone, including iPhone, BlackBerry, Android, Windows Mobile, or Symbian, as well as on your iPad and most major tablets. Whether monitoring your business or home, you will always feel in control. You will instantly know if any suspicious activity is happening on your property. This SVAT system is designed to send you an email alert, complete with photo, if any motion is detected on your property or if any of your cameras experience video loss. Youll always be in the know, no matter where you are. Your security system is only worthwhile if you can actually see the person stealing from you. SVAT cameras are equipped with 600 TV lines of resolution and the DVR records in D1 resolution, which is the equivalent of 720 x 480 pixels or DVD quality. The resulting clear, crisp and accurate video feed will help put the criminal away. The things that go bump in the night are sometimes a thief making off with your big-screen TV. SVAT cameras are equipped with night vision that automatically activates. Thirty-six infrared ClearVu LEDs provide crisp and detailed night imagery as you monitor from up to 100 feet away, even in complete darkness. So thieves may think theyre lurking in the dark but you can rest assured SVAT will see them. Criminals dont take the night off if its raining. Neither do our cameras. Theyre weather resistant and ensure optimal picture quality no matter what Mother Nature decides to throw at you, be it rain, hail or snow. The professional-grade aluminum housing, complete with sunshade, will protect against rust, deterioration and glare. So no matter whats going on outside, SVAT will be ready. Thieves know dismantling a security system is a good way to get off scot free. But theyll be disappointed with SVAT. Each cameras cable runs through the cable mount and then directly into the wall, leaving no part of the cable exposed. Your footage will be secure. Thieves dont limit themselves to just a few rooms. Neither should your security system. Monitor up to 8 areas of your property with this expandable 8CH SVAT DVR kit. 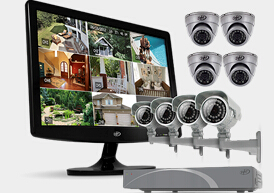 By adding all included cameras youll be able to keep an eye on your entire property, enjoying even greater peace of mind. Our customer support team can be reached by phone, by email and live web chat. Youll always have access to an expert. Support is available in English, Spanish and French.